Heritage is selling what they say is the most important baseball artifact in existence, Babe Ruth's 1923 WS pocket watch. But is it the actual watch that was presented to the Babe in 1923 and why did Barry Halper say he owned one too? It’s the stuff that legends are made of. It’s a remarkable story and in today’s sports auction landscape its just the type of tale that aggressive auctioneers want to hear when consignors bring them their personal treasures to sell. Just recently the Babe’s 1920 Yankee road jersey was purchased for $4.4 million by movie mogul Thomas Tull so, when someone told Heritage Auctions they had the Babe’s World Series hardware from 1923, auction director Chris Ivy saw dollar signs….big ones. As reported by the Associated Press, Heritage and Ivy say they have Babe Ruth’s World Series pocket watch from 1923 and they predict it could fetch close to a million dollars at auction thanks to the priceless story attached to it. It’s just further proof that George Herman “Babe” Ruth is still the king of the billion dollar baseball memorabilia industry. Up on the auction block at Heritage with an alleged current bid of $425,000 (Heritage regularly places their own house bids on lots in order to get them closer to secret reserves) is a 14k gold Gruen “Verithin Pentagon” pocket watch that was allegedly presented to Babe Ruth in recognition of his first world championship in Yankee pinstripes. The auction house with its headquarters in Dallas, Texas, is pulling out all stops to promote its consignment as the auction catalog states, “As Babe Ruth’s personal award for the first World Championship in New York Yankees franchise history, this is arguably the most important article of sports memorabilia that exists.” Even Forbes is telling its readers they should buy the Babe’s pocket watch. It all sounds too good to be true. All that’s missing is a Heritage press conference introducing the Babe’s old caddie recounting his first person tale of Ruth’s mulligans and his relationship with his hero. But that’s impossible, since Lewis Fern passed away last August at the ripe old age of 95 with full military honors. Fern not only caddied for the Babe, but he was also a World War II veteran who served his country as an Army Captain and paratrooper. Considering the timing of his passing, you might think his heirs are the ones putting his treasured Babe Ruth watch up for sale as part of his estate, but that’s not the case. That’s where this Ruthian story gets kind of complicated. 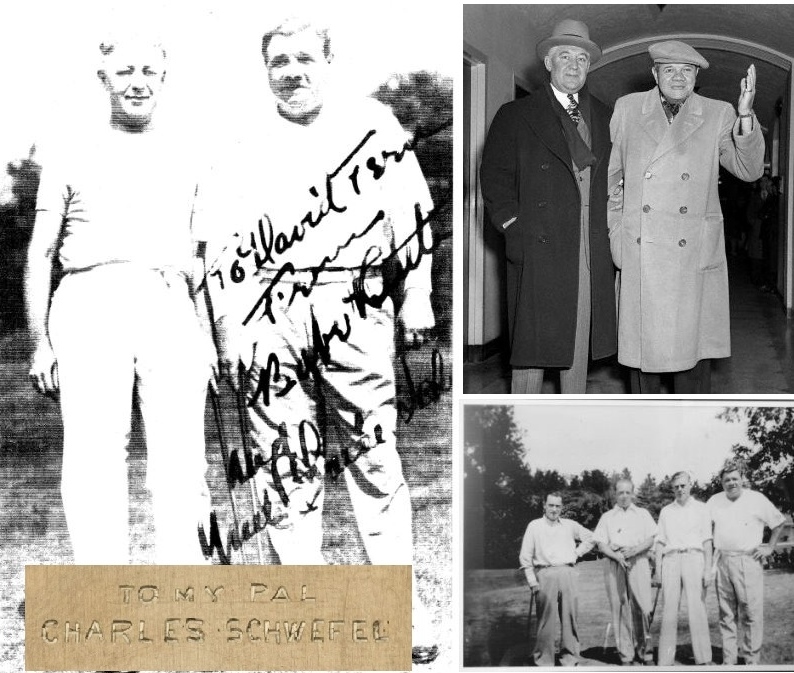 Charlie Schwefel was friends with Ruth and was photographed with him in the press (top right). Ruth and Schwefel signed this photo (left) for his nephew, David Fern, whose brother, Lewis Fern, caddied for Ruth when he played at the St. Albans Golf Club in Queens (bottom right). The watch being sold by HA has "To My Pal Charles Schwefel" engraved on the interior case (bottom left). (Photos courtesy of the Fern Family). Each of the watches presented to Ruth and his Yankee teammates is an expertly crafted timepiece which incorporates a hand engraved scene of a pitcher tossing a ball to a batter and a catcher. Every detail depicted on each watch case, ranging from the face of each player to the folds of each uniform, is unique to each timepiece. 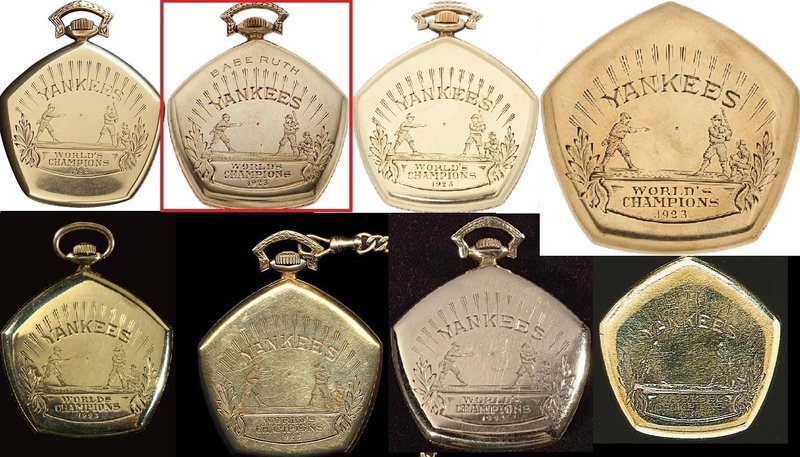 But the most notable difference between other genuine 1923 Yankee watches and the Heritage Ruth watch is the two missing sections of engraved shading to the left and right of the “Worlds Champions” inscription. This shading appears on every watch we examined including examples presented to players Wally Schang, Charles O’Leary and Harvey Hendrick. Inside the authentic watches, there is yet another section which was engraved in block letters to identify the actual player being honored; it is the only element found on each watch that links it to the ownership of the individual players. It is also the easiest element for forgers to replicate and transform authentic awards presented to utility players and scrubs into the hardware awarded to the greats of the game. That being said, Heritage’s Chris Ivy also told the AP, “No one knew where the piece had been. No one has ever seen it for public sale or public auction. The fact that there was no news about it for so many decades, it was just thought that at some point it had been lost to time.” Considering Ivy’s statement, how could he and Heritage ever know that Babe Ruth personally added engraving for his friend to the watch up for sale? How could they ever know if Ruth had his own name engraved on the outside case of the watch when none of the other surviving 1923 watches has a players name in the same spot? Then, add to Heritage’s speculation the fact that the Babe’s own granddaughter, Linda Ruth Tosetti, has long believed that her grandfather’s World Series awards were wrongfully removed from a family safe deposit box at the time of Claire Ruth’s death in 1976. The 1984 Yankee Yearbook lists Barry Halper's 1923 Ruth pocket watch as the number "4" item in his Ruth collection. In 1989, the watch was also mentioned as one of Halper's best Ruth items by Phil Pepe of the Daily News. The person from Atlanta he sold it to was gynecologist Dr. Goodman Espy III via collector and dealer Darrel O’Mary. In an interview with Hauls of Shame Espy said he couldn’t remember exactly what he paid for the watch and referred us to Darrell O’Mary who he said had the letter signed by Fern. O’Mary spoke about the deal and said, “Back in the early days when he was so inspired to build a collection, Dr. Espy didn’t have much knowledge and I sort of became (his) gate keeper for any potential purchases.” As for the discrepancy on the sales price O’Mary declined comment and said he never owned the Ruth pocket watch and added, “I can not weigh in on that. I just cannot professionally do it.” The sale of the watch was one of the largest transactions in baseball memorabilia history at a time when Bill Mastro had just sold his trimmed T206 Honus Wagner for a record price of $110,000. When we asked O’Mary who actually discovered the watch he said, “I can’t remember if Mr. Fern called me or Dr. Espy but at the time he was excited about it and very liquid and that was by far the most he’d ever spent for an item. He was thrilled to get it.” Both men were also very comfortable with Lewis Fern’s representations about the watch and O’Mary recalls, “Lewis Fern was just such a gentleman and class individual, we never doubted its authenticity.” O’Mary says that neither he or Espy were aware at the time of the purchase that Barry Halper claimed he already owned the Babe’s 1923 Series watch. Lewis Fern (left) sold the 1923 WS watch for at least $85,000 in 1988. In a handwritten note from a family album (center) Fern recalls Ruth giving him the watch which was photographed before it was sold (right). Ivy’s reluctance to make the letter public led to our interview of Fern’s widow, Marion Fern, who offered another account which conflicted with the Heritage auction description. Fern told us the watch was given to her husband by Elsie Schwefel when one of her sons had passed away. ”My husband was with (Billy Schwefel’s) mother during part of the funeral and evidently she was supposed to give the watch to Billy, that was one of the sons, and Billy had died, so she passed it on to my husband who they were all close with.” Dwight Fern recalled that Schwefel funeral took place in the early 1960’s. The alleged Ruth watch being offered by Heritage (outlined in red) joins seven other surviving and authentic watches that have been sold at public auction. The watches were presented to Yankee players and executives after the 1923 World Series. While Fern got his watch from his Aunt Elsie, the Yankee players and executives got their gold pocket watches from Judge Landis and it wasn’t until 1927 that the Babe received his first World Series ring. Ruth later added rings with world titles in 1928 and 1932, rounding out his collection with a total of three diamond-studded rings along with the 1923 gold pocket watch. All of them, except for the Babe’s alleged 1927 ring currently in Charlie Sheen’s possession, had remained AWOL until the 1923 pocket watch recently appeared in an Associated Press report and on the cover of the catalog for Heritage’s “Platinum Night’ auction in New York City on February 22nd. Authentic and surviving examples of the 1923 Yankee pocket watch created by Gruen are exceedingly scarce and only a handful (approximately eight) have appeared for sale at public auction in the past few decades. Even the museum at Yankee Stadium could only manage a replica watch for its display. Genuine examples attributed to Yankee executives Ed Barrow, Mark Roth, Paul Krichell and R. J. Connery, however, have surfaced as well as one presented to team trainer “Doc” Woods. To date, the only player watches known to have survived in private hands are the ones Judge Landis presented to to Wally Schang, Charles O’Leary and George Pipgras. In 1991, Sports Illustrated published a story chronicling how Pipgras’ 1923 watch was stolen from him at gunpoint in the 1930’s and found over 50 years later by a pawn shop owner who sold it back to the family for $500. The Baseball Hall of Fame also has a player watch presented to Harvey Hendrick and another that belonged to Judge Kenesaw Mountain Landis. The engraving on Heritage's Ruth watch (top left) starkly contrasts the engraving found on the genuine watches presented to Yankee executives Ed Barrow, R. J. Connery and Mark Roth. 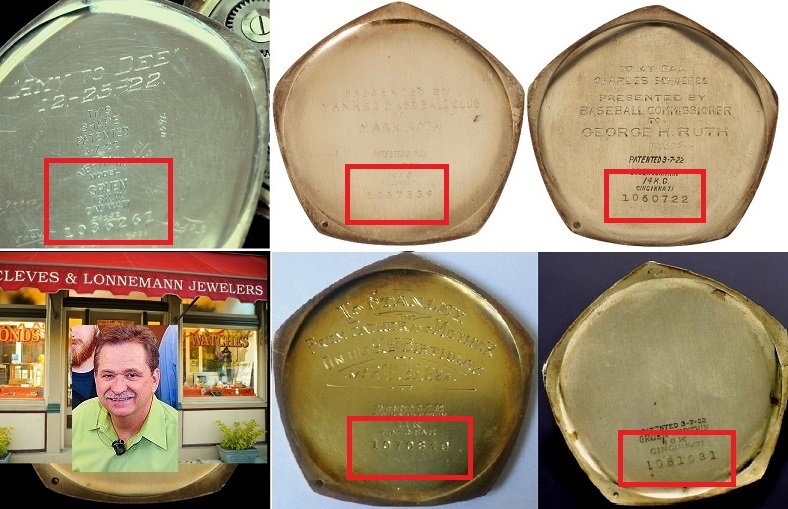 The “long-lost” example currently being offered by Heritage clearly has a credible provenance story that shows how the watch was transferred from Charlie Schwefel to his nephew Lewis Fern. There are, however, several inconsistencies in that story that could very well be the product of some exaggeration or family legend that developed over the decades. Putting that story and those facts aside, however, this 1923 pocket watch has other visible issues totally unrelated to its chain ownership. The most interesting issue appears to be the interior engraving that starkly contrasts the work inscribed into the 14K surfaces of the known genuine examples presented to the Yankee executives. The next prominent issue is that the Heritage offering has case and movement serial numbers that also do not appear to correspond with all of the other existing 1923 Yankee Gruen watches. The serial number engraved on the Heritage Ruth watch is not in the same sequence as the numbers engraved on previous authentic watches sold by Heritage which were once presented to Yankee execs Ed Barrow, Mark Roth and R. J. Connery. The serial number engraved on Heritage’s Ruth watch (1060722) is approximately 3,500 numbers away from the series of numbers found on the other genuine 1923 Yankee watches previously sold by Heritage. Unconfirmed reports state that Gruen sold about 50,000 “Verithin” model watches annually which would mean that the alleged Ruth watch was made months after all of the other known examples. The serial number on the Gruen movement of the Ruth watch is "526564" while the watch presented to Mark Roth has the number "518470." 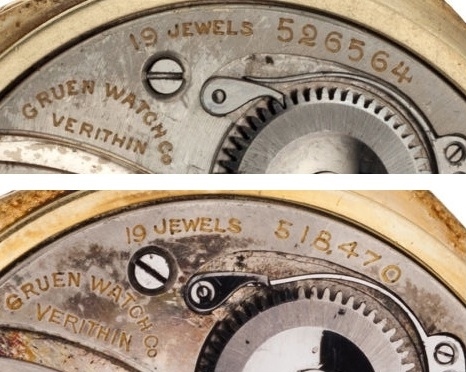 In addition, the serial number found on the actual Gruen movement inside the gold case of the Ruth watch is separated from the other known examples by close to 8,000 digits, thus further suggesting the Heritage offering was created well after the others were assembled. Why? 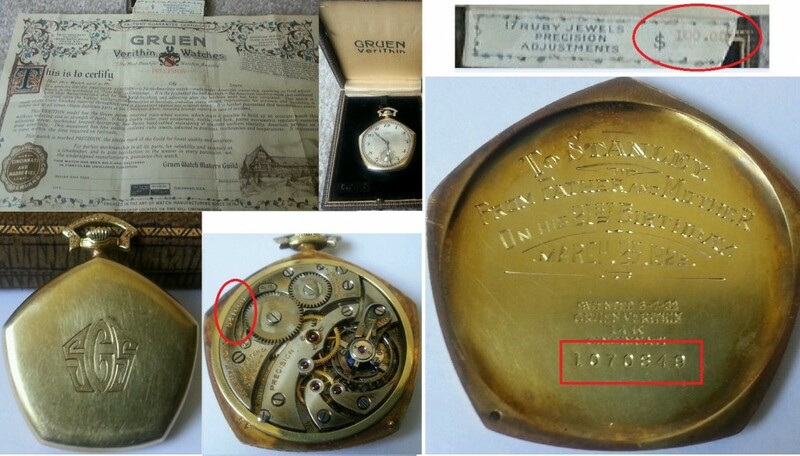 For comparison, another 14k Gruen Verithin Pentagon pocketwatch was offered on eBay recently and was engraved with an inscription dated “March 25, 1925.” The watch was a 21st birthday present and was accompanied by the original presentation box and the Gruen certificate which included the record of its $100 sales price. A similar Gruen Verithin watch was offered on eBay and was inscribed with a date of March 1925. The case number was "1070849" and the movement number was "541668." The watch came with its original papers and was priced at $100 in 1925. The Gruen Watch Company was founded in the late 19th century and at the time the Yankees were presented with their watches, Fred Gruen had already taken control of the Cincinnati company after the death of his father who founded the company. All of the Gruen watch cases and movements were imported from Switzerland and assembled in Ohio and Toronto. A local Cincinnati jeweler named Frank Herschede was the dealer who actually sold Baseball the Gruen watches as referenced in a Cincinnati newspaper that published an image of one of the Yankee watches before they were presented by Judge Landis. In January 1924 the New York Times reported the Yankee World Series watches might be presented to the team at Spring Training (left). Yank exec Paul Krichell's 1923 Yankee watch survived with its original presentation box from Cincinnati jeweler Frank Herschede. An item from a 1924 Cincinnati newspaper (right) illustrated one of the engraved watches sold by the firm. It is possible that the Gruen watches sold by Herschede were chosen by the Commissioner’s office because the Chairman of Baseball’s National Commission, August Herrmann, had been based in Cincinnati since the turn of the century and Herschede was also a stockholder in his Cincinnati Reds franchise. The August Herrmann Papers collection at the National Baseball Library includes files of correspondence from Herschede as well as the papers of Judge Landis and his office during 1923 and 1924. It’s possible there might be some additional documentation of Landis’ purchase of the watches for the Yankees, however, the National Baseball Library has been closed to the public since two key library employees, Tim Wiles and Freddie Berowski, recently left the Hall to take positions at other libraries. That being said, when we questioned Heritage’s Chris Ivy regarding the fact that the interior engraving on the Ruth watch contrasted the engraving found on other executive and player watches, Ivy claimed to have documentation in his possession proving the watch was the exact same one presented to Ruth by Judge Landis on Opening Day 1924. 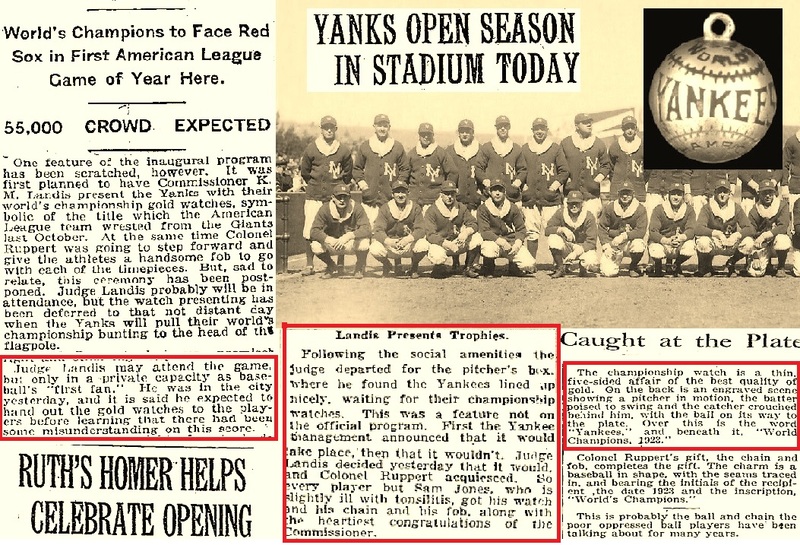 The NY Times reported Judge Landis cancelled the Yankee watch ceremony on Opening Day (1924) but later reports (center) show that he did present them. Jacob Ruppert also gave gold watch fobs to his champs (right). While Ivy and Heritage have issued strong statements about their evidence, they still have no answer for the past claims that Barry Halper once owned Ruth’s 1923 pocket watch. With the inconsistencies in the known provenance stories and the fact that Heritage is apparently unwilling to share information they claim proves Ruth was presented their watch on Opening Day 1924, we can only look to the surviving pocket watches to try and unravel the mystery of Ruth’s Yankee bling. We consulted with one of the nation’s top experts on Gruen watches and presented him with all of the evidence we’ve compiled related to the ten Yankee watches known to have survived. Charlie Cleves, from Bellevue, Kentucky, is the owner of Cleves and Lonnemann Jewelers and is also one of the few people in the country who have acheived the rank of “Certified Master Watchmaker 21st Century (CNW21)” after passing testing administered by the American Watchmaker and Clockmaker Institute’s Board of Examiners. Cleves, who also has his own collection of Gruen “Pentagon” watches, examined images of all the known examples focusing on the engraving and manufacturing elements of each timepiece. As far as the great disparity in the serial numbers on the watch movements as compared to the other Yankee executive watches Cleves said, “I would expect the movement serial number to fall in line with the other ones, but this discrepency could be explained away by the fact that Gruen would put a new movement in your watch if you sent it in for repairs.” So that could explain that issue. Watch expert Charlie Cleves (inset) was able to determine the dates the 1923 Yankee watches were manufactured by examining the serial numbers on the watch cases. Since everything seems to boil down to the actual 14k gold case serial numbers, is it possible that the Yankee executive watches were made months before the watches presented to the Yankees on Opening Day? 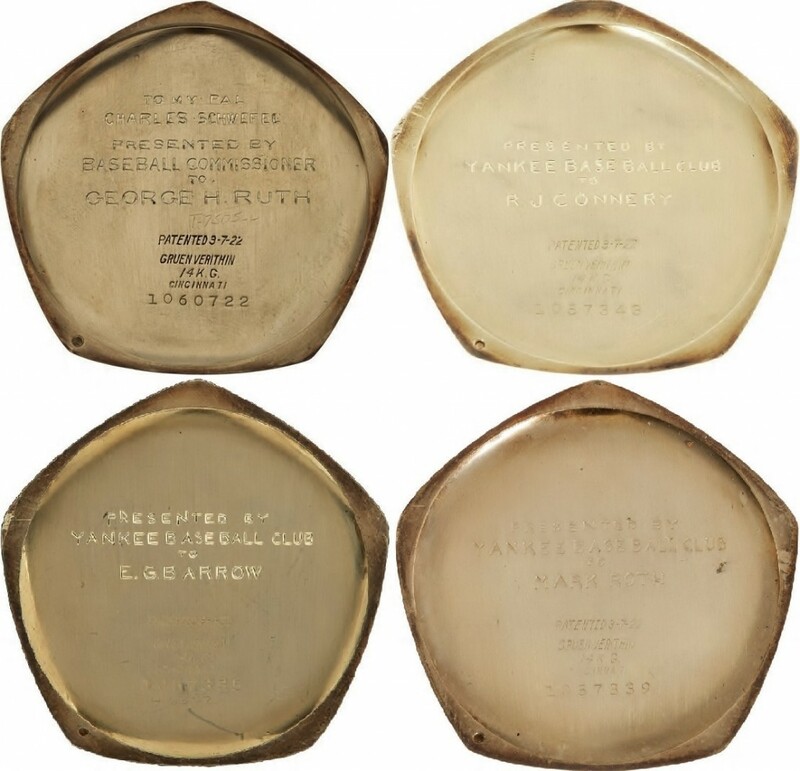 One more mystery tied to this Ruthian saga is the fact that none of the Yankee player watches sold at public auction have included any images of the engraving and serial numbers found on the interior cases. Neither Lelands or Hunt Auctions provided photos in three different sales of Wally Schang’s watch. Hunt never pictured the interior case on trainer “Doc” Woods’ watch in 2004 and Charles O’Leary’s watch sold by Barry Halper at Sotheby’s in 1999 also failed to include a picture of the case. 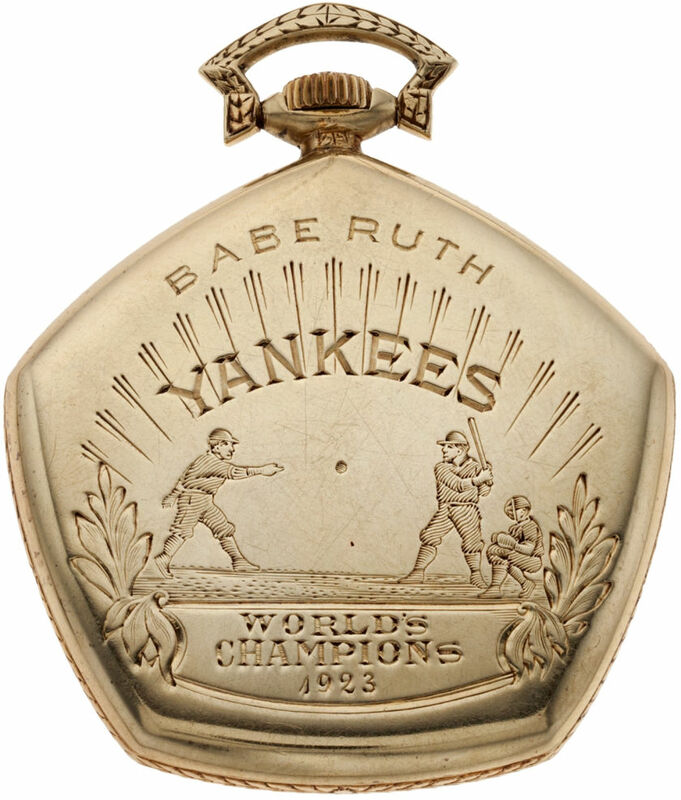 We couldn’t find any images of the other 1923 Ruth watch that Halper claimed to own in the 1984 Yankee Yearbook. That being said, many of Halper’s prominent Ruth artifacts ranging from his rookie Red Sox uniform to a lock of his hair have been exposed as counterfeits in reports that we published at Deadspin and the New York Post. The Babe’s own granddaughter, Linda Ruth Tosetti, has been doing her own tracking of her family’s lost heirlooms and told us she called the Baseball Hall of Fame and found that they had only one player watch in the collection which was presented to Harvey Hendrick. Tosetti, however, could not determine what the serial number was. ”The Hall of Fame told me it was either out on loan or in a display case and that it wasn’t possible to get the numbers,” said Tosetti. Linda Ruth-Tosetti (left) has been searching for Babe's World Series awards; Dr. Goodman Espy and his ex-wife Cheryl (center); Heritage CEO, Steve Ivy (right). Hauls of Shame also contacted the Pipgras-Simpson family and attempted to get a confirmation on the case serial number from George W. “Pip” Simpson, but the undercover cop who was recently in the news after shooting a suspect in a drug bust declined comment. George Simpson Sr. told us he hung up on the Babe’s granddaughter because he didn’t believe it was really her. ”How am I supposed to tell if it was really her,” said Simpson. Without any confirmation on the case serial numbers on the Pipgras, O’Leary, Schang and Hendrick awards, we still can’t be sure that the watch Heritage is offering is the Babe’s first Yankee hardware. Unfortunately, this mystery will continue until this information is researched further and verified. Could Heritage have confirmed this information and still be holding it back from prospective bidders and the general public? If it is revealed that the case numbers on player watches are close to the “1060722″ number on Ruth’s watch its safe to say that Lewis Fern really did have the genuine article. This mystery would be solved. In response, we asked Heritage’s CEO, Steve Ivy, if he knew about the Espy divorce and if the auction house had verified that their client had clear title to offer the watch for sale. We also asked Ivy to address the prior claims made by Barry Halper that he actually owned Babe Ruth’s 1923 watch four years before Espy did? Ivy did not respond to our inquiry. When contacted at her home in Atlanta, the consignor’s ex-wife, Cheryl Petros Espy, confirmed that her husband did not disclose his ownership of the Ruth pocket watch in their divorce proceeding but declined further comment. 1) Copies of fourteen pages of correspondence between the New York Yankees, the office of the Commissioner of Baseball and the watch company dating from late 1923 to early 1924 regarding the ordering of Championship watches. The precise manner of engraving is confirmed by this paperwork, as are the details of the watches’ construction that are specific to the 1923 championship watch order. Only eleven of the thirty-nine watches delivered to the team exhibit a full first name and middle initial as requested in the letter. George H. Ruth is one of those eleven. 2) A letter of provenance from the son of Lewis Fern, who sold the watch to our consignor over twenty years ago. This letter confirms all details of the elder Fern’s own letter of provenance as well as the fact that the watch remains identical in appearance to his earliest recollections of it as a child in the 1950’s. 3) We have discovered that the Championship watches issued to the 1923 Yankees, both front office and player versions, were very lightly hand-scratched with a five-digit code beneath the serial number. The codes are represented by a “46XXX” number and are consistent on all inspected examples, including the Ruth representation. We have determined that this coding was done prior to presentation to the recipients and appears to be present only on Yankee watches and absent on all other Gruen Verithin Pentagon examples we have located in our research. We will include photographic imagery of the other known Yankee watches to illustrate this trait that links each to the same specific population. We then asked, “Would the actual serial number on the case be the most accurate element to determine the date of manufacturing? When we first published this article last February there were still lots of lingering questions about whether the 1923 pocket watch sold by Heritage was actually the one awarded to Ruth on Opening Day in 1924. Gaps in the sequence of serial numbers for watches awarded to Yankee executives and players created some confusion and the fact that so few player watches were available for comparison just added to the mystery of the World Series hardware. But with Heritage Auction Galleries’ current offering of items from Yankee Bennie Bengough’s estate the mystery appears to have been solved—the sequence of serial numbers on Bengough’s 1923 Gruen pocket watch is consistent with the numbers engraved on the Ruth watch. 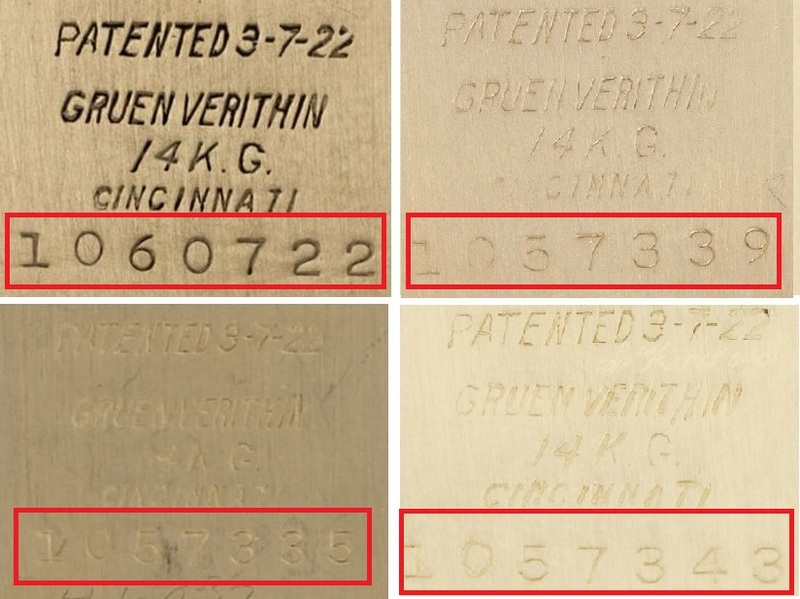 Although the serial number sequences match on the Ruth and Bengough watches, the engraving on each watch case appears to be different. That being said, the revelation made by Heritage makes it even more likely that the 1923 World Series pocket watch that deceased collector Barry Halper claimed to have owned was a forgery. Halper’s alleged 1923 Ruth watch was depicted in Sports Illustrated’s 1995 profile of the collector entitled “The Sultan of Swap.” The watch was also identified as one of the premier pieces in Halper’s Ruth collection in a 1984 New York Yankees yearbook feature written by Bill Madden. 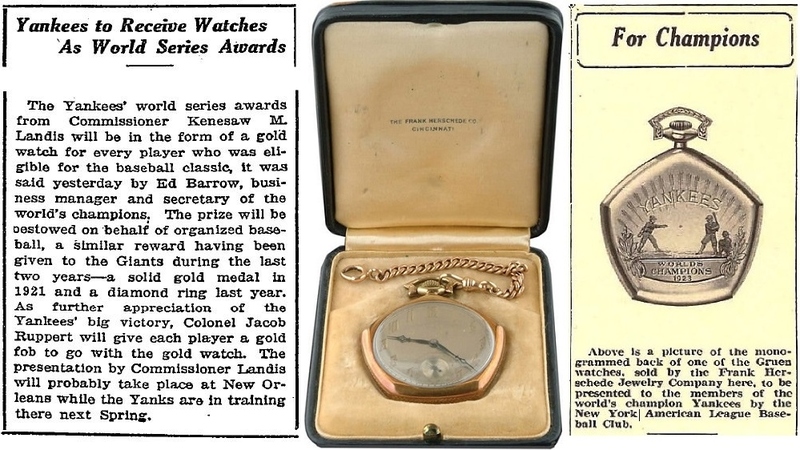 Not sure that has anything to do with anything but, when you say “The alleged Ruth watch offered by Heritage (left) is missing areas of engraved shading on each side of the engraved words “World’s Champions” on the genuine watches of Yankee exec Ed Barrow”, please notice so does the example shown in the 1924 ad. Agreed, but we couldn’t determine if that was an image of an actual watch or an artists rendering (or what Cinci. newspaper that actually appeared in) It was attributed to a Gruen catalog in 1929. Pete Segal from Got To Have It Sports was the high bidder on the watch and this has been verified and put out in print and he wants to display it down the road, in Yankee museum, that he plans to open in NYC, within the next 3 years or so. If you look real close at the both watches in the first picture,you will see that the engraving in one has the engraving in the middle of the ‘N” while the other one has it coming down the ” N “. Also, the leaf engraving on both sides are very different on each watch and the big difference is the ground that the players are on,one is elevated like a mound and the other is flat level ground. So in my estimation one is the real one and the other is a copy ,that was made to look like the original, as there are to many variations in both watches. The most convincing gotcha is the failure to disclose the asset in the divorce proceeding…and that is buried at the end of the piece. I do like the duplicate theory, which could possibly, for once, make a truthful man out of Halper. Perhaps, Peter, you could check in with the family. They love you, no? Although I applaud your commitment to exposing fakes and recovering stolen goods, and you have done an outstanding job, I’m afraid I have to take exception with your additional reporting on Dr. Espy’s divorce which was certainly not a pleasant undertaking. I know Espy personally, and regardless of whether what he did was “wrong” or “right”, I don’t see how financial affairs between him and his wife are really germane to the issue at hand. It certainly appears to this reader that he was speaking “off the record”. Just sayin’. I just wanted to correct my earlier comment. Pete Segal bought the ball given to Johnny Sylvester at auction. As for the bidding on the Ruth watch I don’t know if he’s bidding or not. I really think you are giving this Lewis Fern too much of a pass. Based on all the evidence he clearly lied in his own handwritten note. How can that be explained away? Couldn’t he have been the person who had the engraving added later? How could HA ever know Ruth added the engraving. Also, what does HA’s addendum really mean? What is said in these letters and where did they come from? Why all the secrecy from the AH? The watch either had an repair done to the movement, or that Ruth ordered at least one duplicate. Having said all that, I would hope that the many questions surrounding the item would have a dampening effect on the eventual sale price, but I won’t hold my breath. PS: What do you make of HA’s assertion that there was a “lightly” hand scratched extra serial presentation number (46XXXX) added to the player’s watches? Does it show up at all on any of the photos of the watches? Very odd explanation (after the fact, too) from the auction house! I just read your Feb 22 update. Thanks! That makes better sense of the “added” number, but I’ll be looking forward to your next posting once HA responds with the “additional” photographic documentation. As far as I can see this “46xxx” hand scratched number is only on the Ruth and the Ed Barrow watch which was also sold by HA. That doesn’t show any consistency from what I can see. I can only go on the images posted in the prior auctions, but you’d think an AH would want to post all of the information for anyone interested not just bidders. Not to mention the documents they say they have. It will be interesting to see what the source of those documents are since I made an inquiry to the HOF for the related Hermann Papers since the NBL is currently closed. Tom Sheiber responded only to say that Brad Horn needed to answer the inquiry, but Horn never responded. Pete, you usually hit it out of the park but this one seems like a big swing and miss to me. You can definitely see a 46033 scratched under the serial no of the Mark roth watch. To tough to see on the others except Barrow & Ruth. But that evidence is pretty tough to argue. And the guy code breaking is pretty low. As a man who has been through it the fact that you went to the ex (or soon to be) of the consignor is not cool what so ever. As the jeweler said, those codes signify work done on the watch by a jeweler and without more info you can’t be positive of what exactly the work was. 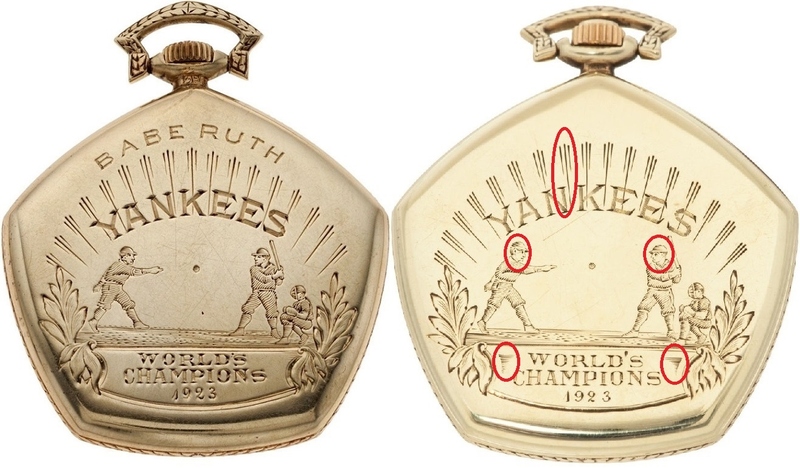 That still doesn’t explain the much bigger issue of the Ruth watch having the serial number starting with “106…..” and the others “105…” Not trying to hit anything out of any park just trying to determine if this actually was the watch presented to Ruth on Opening Day 1924. If other player watches showed the “106..” serial number that would go a long way to proving the watch is definitely Ruth’s award and not a replacement or a second copy issued later. If that were the case I’d have no problem with that, the mystery we have here would be solved. That was the purpose of the report. As for the matrimonial issue, it was the auction house who threatened litigation on behalf of the consignor just for questioning the watch. The consignor revealed that he was hiding the asset from his wife in his interview which was on the record. The bottom line now is, someone paid 600 g’s for a watch he or she thinks is the real deal so, case is closed, cause if it isn’t real, they threw their $’s away on garbage and if it is real, they have a one of a kind item to brag about for 600g’s less out of their bank account.